The dream of every team and coach is to win a state title. But to win a state title by dominating all competition is a true example of talent that has paid the ultimate price. The team's decision was to set specific goals, work as a unit and train while others were resting. In addition, they were able to remain mentally tough throughout the whole season, which made their accomplishment even more amazing. 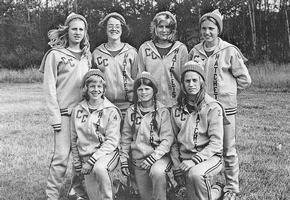 Preseason training by the 1976 girls' cross country team was what allowed them to start the season in mid-season form. Coach Gordie Erickson definitely prepared the girls properly as they ran away with Tomahawk's first state title. In 1976, girls' cross country was one large division and Tomahawk left no doubt about who the big dog was in the fight. Imagine being at this event and seeing Suzie Houston repeat as an individual state champion. Then imagine her teammates crossing the finish line as coaches were frantically trying to keep track of their team points before the official team scores were announced. A 25 point margin separated Tomahawk from defending state champion Prairie du Chien. The girls had lived up to the billing that they had earned all season long. They proved to the state of Wisconsin that they were contenders and not pretenders. They had made the big step up from participators to competitors. Little did anyone know of the dominance that Tomahawk would have in cross country at the conference, sectional and state levels over the next 30 plus years. To date, no other athletic program in Tomahawk has produced more state level accomplishments than cross country. Coach Gordie Erickson conditioned an amazing group of young ladies led by Suzie Houston and her teammates Tammy Barr, Marlene Renn, Theresa Bassett, Karen Brennan, Alicia Gamble, Delores Roberts, Bev Renn, Denise Leverance, Connie Rasmussen, Jessie Stiff, Jane Orcutt, Paula Meyers and Lynn Rummel. The cross country girls ran a second team, but the JV team didn't have much competition as other schools were unable to field two teams. The JV team placed third in the conference.